If you do not intend to use particular Moodle courses, they can be removed from your listing on your My Home page by designating those courses as unwanted. Note: Instructors should NOT use this feature to hide or remove courses from the Moodle My Home page. Doing so will result in a loss of student and course data. Instead, please visit Grok article # 18425 for instructions on how to manage the number of courses displayed on the My Home page. 2. Click the Unwanted Course link, located in the Course Preferences Block on the Home level of Moodle. 3. Click the check box to mark any courses as unwanted. NOTE: By default 8000 and 9000 level courses are set as unwanted. 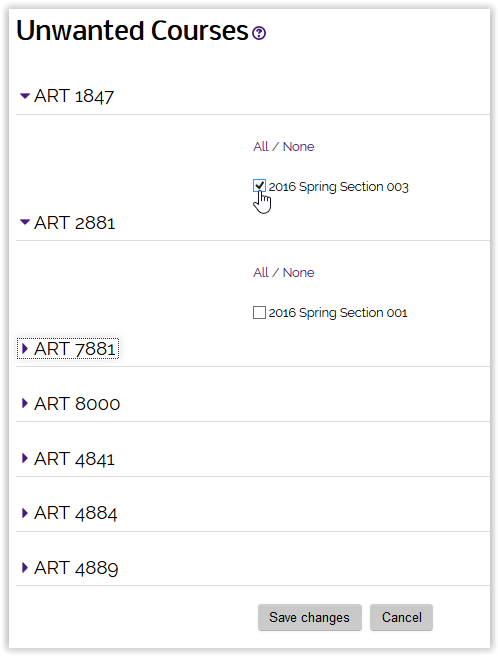 If you want to create an 8000 or 9000 level course, uncheck the unwanted box for that course.